What’s more fun than the challenge of pushing yourself to climb to the top of a wall… the rewarding splash back down into the pool afterwards! 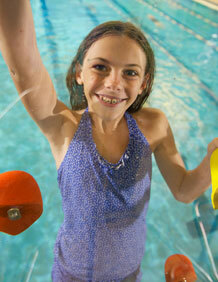 Kersplash® pool climbing walls are made by the experts. A team of climbers and aquatics professionals have put together this top-of-the line product. Made with 100% stainless steel, Kersplash was designed to outlast in harsh indoor and outdoor aquatic settings. The stainless steel is passivated and coated with Spectra-Shield and the sturdy panels and hand holds are UV treated. Kersplash® brings together two great sports, swimming and climbing. Both climbing and swimming increase fitness levels through development of strength, coordination, cardiovascular endurance and muscle endurance. Kersplash also provides participants with positive risk taking and creative problem solving. This Kersplash® wall features a bold and colorful panel to accent your aquatic space. The Color wall features a stainless steel structure and our Groperz™ Hand Holds. This Kersplash® wall features a clear panel which presents no visual barrier on your pool deck. Our most popular model, the Crystal Clear® wall features a stainless steel structure and our colorful Groperz™ Hand Holds.